Description: Katy Kackler is a beautifully detailed wooden hen with legs and wings move when she is pulled. She also makes a realistic "cluck-cluck-squa-awk" when pulled. 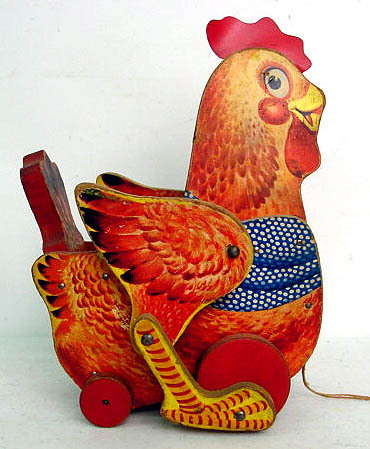 Katy Kackler is the first of 3 wooden hens that Fisher-Price made. FPT4060 - Wooden hen with wooden jointed wings and legs. Hen has colorful paper lithographs on her head and all sides of her body. She has red feathers, big eyes, and has a blue shaw with white polka-dots around her neck. She has red plastic crown feathers on the top of her head. When pulled, her wings flap and she makes a "cluck-cluck-squa-awk" (concealed voice) noise, just like a real chicken. Measures 9-1/2" high, 7-3/4" long, 5" wide. 1954 original retail price was $2.50 in the East and $2.69 in the South and West. 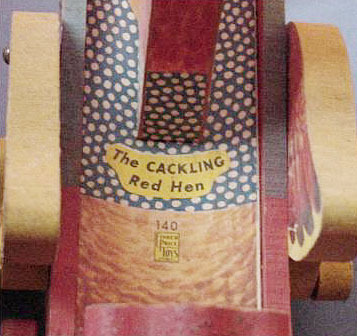 Also see 1966's #123 Cackling Hen for another red chicken.